Noise induced hearing loss (NIHL) is irreversible hearing damage resulting from continuous exposure to high levels of noise. NIHL affects an estimated 10 to 15 million people in the United States, making excessive noise exposure the most common cause of hearing loss. NIHL can be caused by a sudden intense sound, like an explosion, rifle shot, or firecracker, or by continuous exposure to loud sounds over an extended period of time. Repeated exposure to sound levels greater than 85 dBA can damage the hair cells in the cochlea of the inner ear, and also the nerve fibers that relay sound to the brain for processing. Symptoms of NIHL increase gradually. Over time, sounds may seem distorted or muffled, and it may become increasingly difficult to understand speech. Someone with NIHL may not be aware of their hearing loss, but a hearing test can divulge the problem and promote early treatment. People of all ages can develop NIHL. More than 30 million Americans are exposed to hazardous sounds on a regular basis. About one third of the 28 million Americans with hearing loss likely developed NIHL from noise at work or leisure activities. Noise is one of the most common occupational health hazards, and NIHL is the main concern in industrial, manufacturing, entertainment, and farming environments. 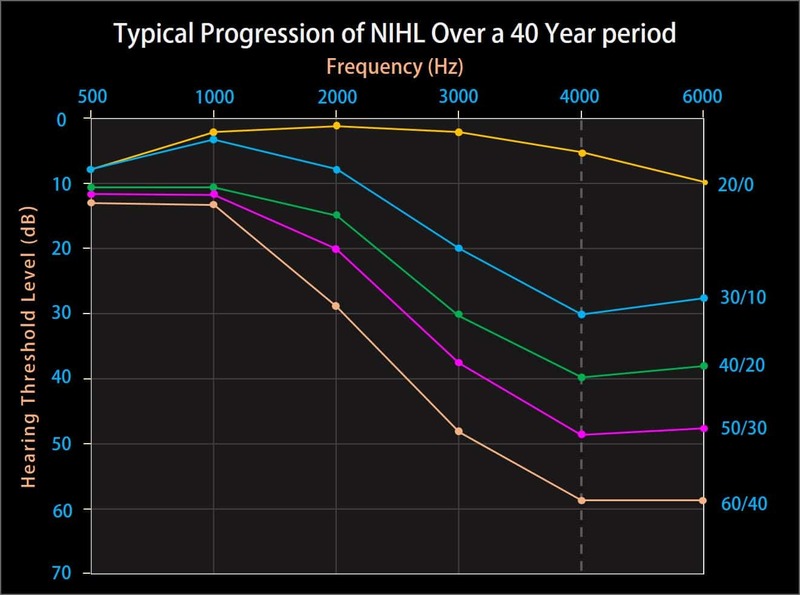 As NIHL progresses, the hearing loss may eventually spread to frequencies where human speech is pervasive…in the range of 500-3000 Hz. If NIHL becomes pervasive in this region, understanding speech will become difficult. The following figure (below) is from a peer-reviewed research paper by Dr. Li: Genetic influences on susceptibility of the auditory system to aging and environmental factors. The left panel (A) shows healthy hair cells, but (B) shows noise-induced damage, indicated by fused hair cells (yellow arrows) and scars (white arrow). The damaged hair cells in (B) were subjected to noise exposure of 120 dB for just 5 minutes! The sensory hair cells lining the cochlea are extremely sensitive to noise. Once they die, there is no coming back…the damage-caused hearing loss is permanent! Noise-Induced hearing loss is permanent! Are you ready to see where you stand?